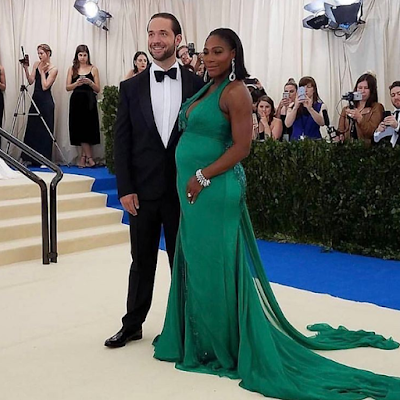 Serena Williams flaunts baby bump in Green as she steps out with Fiance Alexis Ohanian for the 2017 MET Gala..
Tennis star Serena Williams was nothing short of stunning as she stepped out on the red carpet for the first time since sharing her baby news. The top athlete who was joined by her Fiance Alexis Ohanian at the MET Gala that held last night as glistened in this green number.. The mum to be lovingly cradled her bump as she posed for the several cameras jostling to take her photos..